How long have you been living in France? I moved to Paris in 2001 and have been visiting Beirut very regularly. In a way I could say I am driven by a sense of belonging which makes me want to spend more time there. I was commissioned to make some documentaries between 2004 and 2006, but my main practices have been video and photography. What kind of documentaries have you made during your visits to Beirut? They are mainly political in nature. What is the relationship that binds your works? I continuously come across this question about the subject matter of my works. I do not have a specific subject matter, my main concern is video, the medium. In other words, I am interested in video as a medium and how to produce video as work. So my video pieces can be on any given ‘subject’ while the shooting of the video is what is conceptually central to them. For instance, how does one shoot a video in one sequence and in one shot? My video works are not outcomes of pre-production processes involving researched projects seeking ways of translating ideas into images. Instead they are the product of production, of process, where each work is an idea and its creation. Did you study film? What is your interest in investigating video as medium? I did two years of cinema studies but was dissatisfied with the cinema school I attended, and they were not really interested in video art. I then went into digital art. After that I did a residency in Le Pavillion at Palais de Tokyo and École des Beaux Arts de Paris, where I developed my ideas on video making. My first drive was to make documentaries but I ended up shooting films as very long interviews. At the same time, I was developing my video work. I can say that I felt freer in video. The fact that my video works started to be promoted and in demand within French institutions has supported my choice of working with video. I am working on projects that are not within video. In the history of video art I can think of a long list of names that have investigated video and film as mediums. Some of those artists have placed restrictions on themselves in order to produce their work, and your way of making a video in one shot, in one sequence, is also a restriction. I place restrictions or constraints because video has become a popular medium that is widely used by everyone with a camera. This requires bringing in a different kind of creativity to this medium. The same applies to photography, though they are two different mediums and have differing realities and contexts. If we look into the history of photography, it started as a very professional and private means of production with an identity. After its mass use in society, the discussion of photography as art came about. In that sense, I think video is also on a similar track. Hence, as an artist, I place restrictions on myself while making work because the necessary or basic conditions – such as having a camera and a film – are not enough to start a creative process. The restrictions, however, bring this about. I shoot a maximum of three minutes and have a minimal post-production phase. This is as with the first films and cameras used by the Lumière brothers, which had a length of film rolls of two and a half minutes. Have you taken part in workshops or residencies? In 1999 and 2000 I attended a workshop on film and video taught by Lebanese filmmakers Akram Zaatari and Mahmoud Hojeij entitled Transit Video Workshop in Beirut. They were very influential to my later practice. I am currently doing a residency with the Sharjah Art Foundation. What was the Transit Video Workshop like? The workshop was formed of artists from the Arab world and was composed of screenings of video art. Beside the informative, theoretical part, we were also handed cameras to make one-minute videos. Did the resulting workshop films involve post-production? Editing is a particular phase and another form of creation. As I have mentioned, I prefer to make a single shot of a scene or a sequence of scenes, connecting them with a fade in and fade out, and framing them with the title and credits. For instance, Tokyo Tonight (2003) is composed of three sequences added one after another. I am not against editing although I prefer to use minimal editing tools where the process of post-production becomes a simple act of bringing together the main body of work with its frame. Your video works vary in their subject matter. For me, it feels like you are dealing with familiarities such as cooking a lentil dish in Mdardara (2007), as well as a feeling of strangeness in familiar surroundings, such as Tokyo Tonight (2003). You have a point, especially with the concept of the familiar. I’ve made around fifteen videos and they have all related to things I have experienced around me. In WA (2004) I filmed my niece and nephew singing. I work with my surroundings first and foremost, and try to translate what I am familiar with. I also enjoy and choose to work with the minimum, in the sense that my productions require a very low production budget. You could relate this to Arte Povera somehow. And this aspect is an advantage when applying for funding from production houses or in getting support for projects. As you might guess, asking for 1,000 Euros for a video work is easier than 15,000. One of the reasons I work on small scale productions is also due to their manageability. How do you perceive yourself in the international arena? topics emerging from ‘developing’ countries. Let us focus on one of your video works, Terres de Pomme de Terre (2009), which formed part of your recent solo show at the Galerie Almine Rech in Paris. This piece depicts familiar objects, namely potatoes, alongside a composition of strange relations to that object, namely using the potato as a body building tool rather than a food product. Can you say more about the merging of these two aspects within the work? What I tried do in this piece was a little new. It’s related to a former series of photographs of potatoes (in different stages of transport, storage, planting, etc.) in Europe in the form of a documentation of the trade of potatoes from one continent to another and the economic and political relationships this produces (in the sense that potatoes grown in Lebanon came from seeds bought from the Netherlands, for example). The photography project took place over the course of five years while I was travelling between Northern Europe and Lebanon. The video piece started from a single photograph in that series. It was shot with an 8mm film, and the medium worked to underline the fact that potatoes are mostly cultivated by families and relatives. Hence their farming is done by a close group of people that are members of a family. By using 8mm film, I wanted to reflect on the notion of memory and the significant (familial, constitutive) act of working/producing together. What about the bodybuilders in Terres de Pomme de Terre, what is their relation to this context? For each piece you need to have a margin of some sort. I think it is my tendency to deconstruct the documentary style through a personal game that causes a shift in its nature. In other words, filming images of potato farming, farmers, the hard labour associated with it, and so forth, on their own would have been a mere documentary. I wanted to break this with something irrelevant at first sight. This apparent irrelevance also relates back to the fact that the basic means of producing food and its consumption are distinct. Labour is something that is very social and embodied, and this is different from consuming French fries. My approach to this difference is to show bodybuilders using potatoes for their training. The business of agriculture and farming sometimes can be more profitable than banking! I studied and trained as an agricultural engineer at the American University of Beirut. I also personally believe in the power of agriculture. 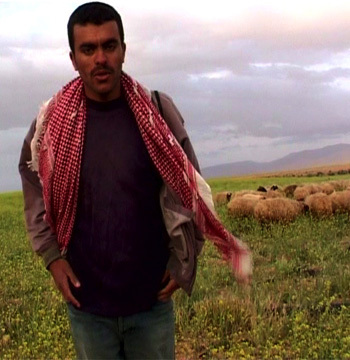 After my studies, I worked in the fields, as well as working as Akram Zaatari’s assistant on a number of his photography and video projects. How did you grow interested in art to begin with? In the beginning I was interested in video. My family had a high-8 camera, but when I was young I did not have artistic interest and did not know much about it. Before my studies in engineering, I had applied to the arts department. Hence, my real involvement started when I was still studying, through my assistantships with a number of videomakers and filmmakers. That is how I got involved with the Arab Image Foundation and met Jean-Luc Moulene during his residency in Lebanon. That was quite a significant encounter for me. What is your relationship to image, what is an image for you? An image is an idea. Fatos Üstek (1980, Ankara, Turkey) is an independent curator and art critic, based in London, UK. She is founding editor of Nowiswere Contemporary Art Magazine (with Veronika Hauer); member of AICA TR; currently guest tutor at Vision Forum, Linkopings Universitet, Sweden; main writer of www.artchive.org.tr; regular contributor to magazines Camera Austria, Austria; Kunst(h)art, Belgium; Artluk, Poland. Ziad Antar was featured in the New Ends, Old Beginnings exhibition.